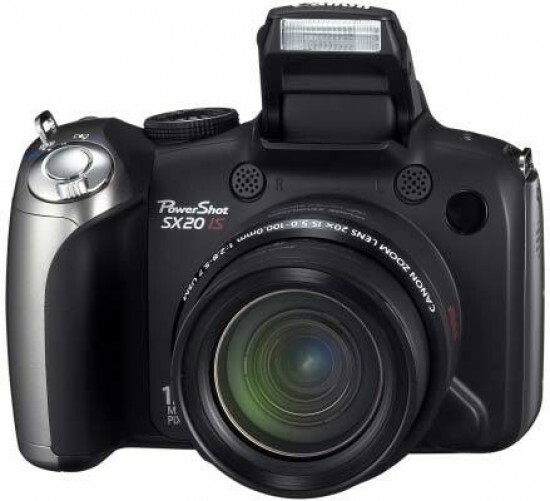 The Canon PowerShot SX20 IS is a new super-zoom camera, sporting a 20x zoom lens equivalent to a focal length of 28-560mm. Successor to the SX10 IS model, the Canon SX20 IS additionally features high-definition video (720p), with a dedicated movie button for instant access to movies in still mode and instant stills shooting during movie recording. There's also an an HDMI mini port that makes it easy to play back footage on compatible TVs. The megapixel count has been increased from 10 to 12, and Canon have included image stabilisation to help ensure that the majority of your shots are sharp, plus there are Ultrasonic Motor (USM) and Voice Coil Motor (VCM) technologies that promise fast, accurate and quiet zooming and focusing. 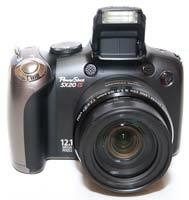 Full manual control over both aperture and shutter speed, a 2.5 inch vari-angle LCD II, an electronic viewfinder and external hotshoe complete the SX20's headline specifications. Priced at £399.99 / €499.99 / $399.99, we find out if the Canon PowerShot SX20 IS can compete with the super-zoom big boys. Following on from last year's SX10 model, at launch the SX20 IS officially costs the same in the US, but slightly more in both the UK and Europe. This is a DSLR-styled compact camera with a versatile 20x image stabilized optical zoom, providing a broad 35mm equivalent focal range of 28mm to 560mm, and making it a direct challenger to the likes of the Olympus SP-570UZ, Panasonic DMC-FZ38 and the Casio EX-FH20. As with its forebear, the SX20 IS features built-to-last hard plastic bodywork with a larger than average grip offered, its size partly due to the four alkaline AA batteries required for power slotting into its base. While this contributes to overall weight as well as a feeling of solidity (at 560g), a matt black finish lends an overall air of sophistication, a point of difference being the metallic silver grey encircling the shutter button and left hand side of the grip (if the camera is viewed lens on). 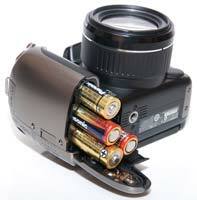 If you're looking for a camera that will slot into a jacket pocket, however, think again. The SX20 IS' dimensions are not much more compact than an entry level DSLR, so it's a case of attaching the provided strap for over-the-shoulder portability, or investing in a dedicated camera bag to protect it from the elements and prying eyes when out taking photographs. There's no full hard copy manual provided out of the box, just a very rudimentary getting started pamphlet, with the full manual on CD. While the latter is fine if you're chained to a PC, when you're outside shooting and can't track down the setting you want, not having a manual to hand to quickly flick through is a right royal irritant. The new Hints & Tips feature incorporated within the user interface partly makes up for the this, providing short descriptions of key functions, but it's obviously not as in-depth as the full manual. More positively a hotshoe for an accessory flash is offered in addition to the built-in raised variety, plus a flip out and twist (or in Canon parlance 'vari angle') 2.5-inch LCD screen at the rear. This monitor tilts forward through 180° and backwards through 90° in order to achieve those otherwise awkward angle shots when users can't quite get their eyes level with its electronic viewfinder, such as when shooting low to the ground or over the heads of a crowd. As touched on earlier, the Canon SX20 IS offers a huge zoom range that's not only much more portable and cheaper when compared with its equivalent on a DSLR but also has the advantage of being able to shoot video clips. Canon have fixed one of our key criticisms of the previous model and upgraded the video quality to 720p HD, although it still falls short of full HD 1920x1080 pixel video. It also boast stereo sound courtesy of microphones positioned either side of its lens, plus a dedicated button at the rear that activates the video feature whichever shooting mode you're in. Marked by a red dot that universally signifies a record button, this falls readily under the user's thumb at the rear of the camera. Looking down on the SX20 IS, you're presented with a fairly busy but well-spaced smattering of clearly labeled and sufficiently large buttons and dials. These run in an L-shape from the flash button at the far left, across the familiar DSLR-like hump housing the electronic viewfinder, built-in flash and hotshoe, to a shooting dial on the other side featuring no less than 13 user selectable modes. Canon have improved the feel of the mode dial so that it no longer accidentally moves into another position when placed inside a pocket or bag. 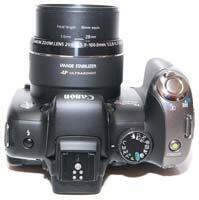 The aforementioned shooting modes range from full auto, through program, shutter priority, aperture priority and manual to a user-attributable custom setting – and, as you twist the physical dial, a virtual version appears in the top right hand corner of the rear screen if it's in operation, or in the EVF above if it's not, so you don't need to take your eyes off the subject. This is handy, as we found the camera sometimes confused by busy scenes, so being able to re-compose a couple of times without missing the shot is a bonus. Further, this time pre-optimised modes include dedicated settings for shooting portraits, landscapes, night snapshot, sports mode, a grouped selection of scene modes, including the familiar likes of a dedicated fireworks setting among others, plus a stitch assist mode to help with shooting a sequence of shots for compositing together later as a single panorama. The final mode on the dial is that for capturing movie clips. Adjacent to the shooting mode dial is a recessed but big enough on/off button that glows orange when the camera is activated, and on the forward slope of the grip itself we find a main shutter release button encircled by a rocker switch for controlling the whopping zoom. Press the power button and the responsive SX20 IS primes itself for an initial shot in just over a second, the zoom barrel extending to maximum wideangle setting and the rear 230k-dot LCD, or 235k-dot EVF, bursting into life for composing the image. 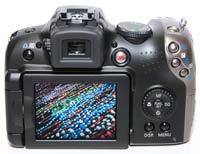 Unlike rivals, there's no obvious EVF/LCD button for switching between the two – as the camera's default, this task falls to the display button. 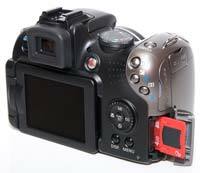 Instead the camera can be set up so if the LCD screen is facing into the body upon power up, the EVF automatically bursts into life. Alternatively, if the screen is facing out at the user, then it provides that method of shot composition. As you'd expect from an enthusiast model, shutter delay is imperceptible and committing of full resolution images to memory takes less than a second at highest resolution – so no complaints as far as operational speed is concerned. Sound-tracked by a low mechanical whirr the zoom is also very responsive, so much so that determining an exact point in its range can be tricky, though, unusually, markings detailing incremental steps throughout its range are etched onto the top of the lens barrel. You can tab through these in baby steps with a gentle nudge of the lever. As indicated on the lens barrel, an Ultra Sonic Motor (USM) ensures your zoom transitions are commendably smooth and jerk free. Given the Canon's relative bulk, it feels most natural to hold the camera with both hands, and fortunately there is enough of a ridge to the left, when viewing the camera from the rear, and at the back by the hinge for the LCD, for the user to do so without inadvertently smearing the screen with thumbprints. Moving to the back of the SX20 IS then, and top left of the LCD is a direct print button that will be familiar to users of the Canon PowerShot range that doubles up in shooting mode as a user assignable short cut key to the likes of red eye reduction or auto exposure lock. Adjacent to this we have the rubber eye relief for the electronic viewfinder, just set back from a partly recessed dioptric adjustment wheel, while on the right hand side of the EVF we find the aforementioned record button for shooting video clips. Luckily, the full extent of the optical zoom can be deployed when filming, and coupled with the stereo sound, this means that, while no match for a dedicated camcorder, video clips look better than expected from your average compact. Top right of the camera back are a trio of buttons set into the back of the curved grip whereby they fall immediately under the thumb. The top one is self evidently for image playback, its positioning meaning you can quickly check the results of a capture while your finger remains hovering over the shutter release button for the next possible shot. A press of the next one down brings up an exposure compensation slider (+/- 2EV), or, if alternatively the user is still in playback mode, allows a sequence of images to be 'jumped' to find the one you're looking for more rapidly in this age of ever larger card capacities, search criteria determined either by a number of images, categories or folders. The bottom and last of the three smaller buttons is for deleting images when in playback mode, or when in capture mode, lets the user move the otherwise central AF point to another portion of the screen. This is effected in conjunction with the four-way control pad with central 'function set' button and fiddly scroll wheel that encircles it just below. At four points around this pad are, at 12 o'clock, a means of determining manual focus. Press this and you're presented with a distance slider on the right hand side of the screen and an enlarged central portion of the image so focus can be more accurately determined. The rather over sensitive scroll wheel is used for moving through the available range. At three o'clock is a setting for adjusting ISO – here a range that moves from ISO 80 through ISO 1600 – while at six o'clock is a means of switching from single to continuous shooting or choosing one of the available self timer options. Moving around to nine o'clock we find a close up mode – with either macro or super macro settings possible. Press the function/set button at its centre when in any of the capture modes, and an L-shaped toolbar that will be familiar to Canon users appears on the screen, offering pull out toolbars with further options from the range when you come to rest on a particular setting. In auto mode, only resolution/image size for stills and video is highlighted from the range, whereas if you move into one of the more creative PASM modes and press the button again, you can choose from any of the now fully accessible options. These include being able to adjust white balance, select from the familiar Canon 'My colors' modes – of which we preferred the 'vivid' setting for added visual punch – the chance to bracket exposures or focus, tweak the intensity of the flash, plus switch between evaluative, centre weighted and spot metering. Beneath this control pad and wheel are two more familiarly marked buttons, this time for image display and menu. With subsequent presses the former turns the display on off, or calls up a nine zone compositional grid with live histogram. A press of 'menu' meanwhile provides the user with the ability to select from four separate folders – the first containing a comprehensive list of shooting options, the second being the fairly generic set up menu, and the third for accessing user-defined My Menu settings. Again the PowerShot SX20 IS is as quick and responsive as you could hope for as you tab though and effect the various options. While it is capable of shooting JPEG stills and high definition video however, one thing the SX20 IS still omits that several competing super zoom cameras include is RAW capture, which really would have made this an appealing proposition for current DSLR owners looking for a second camera. While the left hand side of the SX20 IS, if still viewing it from the back, features a built-in speaker and catch for attaching the provided strap, the right hand (grip) side is slightly busier, featuring a dedicated slot for an SD or SDHC card protected by sliding cover near the base, above which is a plastic flap covering its USB port and new HDMI port, and a further flap hiding DC in and AV out ports. None of these covers feel as flimsy as on competing models, and reinforce the view of the SX20 IS as literally a solid contender. Flipping the camera upside down you find a familiar screw thread for a tripod at its base, and slightly stiff (and so awkward) sliding cover for the battery compartment that houses the four AAs needed for power.